How does the mission proceed during the third season of The Expanse TV show on Syfy? As we all know, the Nielsen ratings typically play a big role in determining whether a TV show like The Expanse is cancelled or renewed for season four. Unfortunately, most of us do not live in Nielsen households. Because many viewers feel frustration when their viewing habits and opinions aren’t considered, we’d like to offer you the chance to rate all of the The Expanse season three episodes here. A Syfy drama, based on the science-fiction novels by James S. A. Corey (i.e. the pen name for authors Daniel Abraham and Ty Franck), The Expanse stars Steven Strait, Shohreh Aghdashloo, Dominique Tipper, Cas Anvar, Wes Chatham, and Frankie Adams. The story unfolds 200 years in the future, in a colonized galaxy, when two strangers are caught up in a vast conspiracy. Season three kicks off immediately after the events of the second season finale, with Earth, Mars, and The Belt at war. The quest to discover the secret of the protomolecule intensifies and every decision made risks the survival of the solar system. **Status update below. What do you think? Which season three episodes of The Expanse TV series do you rate as wonderful, terrible, or somewhere between? Should Syfy cancel or renew The Expanse for a fourth season? Don’t forget to vote, and share your thoughts, below. **5/26/2018 Status Update: Amazon has picked up the fourth season of The Expanse. Details here. **5/11/2018 Status Update: The Expanse has been cancelled by Syfy, but there’s still hope for season four. Details here. 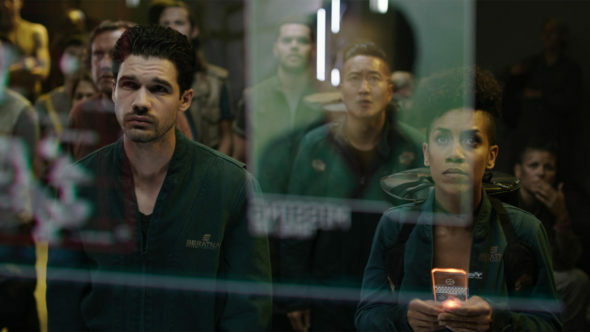 More about: The Expanse, The Expanse: canceled or renewed? Sadly, The Expanse has been cancelled.